In some ways Melody Walker’s punchy character laden vocals remind me of Bonnie Raitt, no bad thing as far as I’m concerned, being a lifelong fan of Bonnie’s! The reason for this is her blend of soulfulness and the total commitment to inhabit the song as if she is actually living the lyrics. There is no subterfuge or attempts to soften her spirited feminine vocal style, something these beautifully written, arranged and performed songs benefit immensely from. 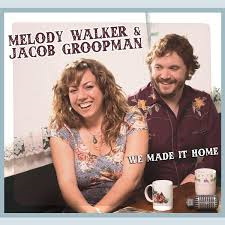 Jacob Groopman’s warm vocal style is a perfect foil for Melody’s, ensuring the album contains some tremendous harmonies but with none of the cloying sweetness that many seem to think is such a good idea. In a nutshell, an album of songs that have a strong sense of reality. This is an excellent stripped down collection of folksy bluegrass and more by a talented duo, both of whom are very good lead vocalists as well as having a nice harmonic blend. It often has a lovely rural front porch feel and the sparse instrumentation is beautifully arranged and played on songs that despite keeping within a loose bluegrass/old time folksy framework are still an exercise in this couples versatility and diversity. There is often an easy going laid back feel but where necessary they are able to inject a strong sense of drama. The harmonies, despite the excellent blend, always have a nice edge which gives the album a solidity that many similar albums lack; in many ways, the difference between having a blandness that makes it virtually aurally invisible and a power that ensures it is highly listenable and interesting, which this recording most certainly is. Much of that is down to the stylistic versatility and the ignoring of generic boundaries exhibited by these two versatile artists. The album has a sparse instrumentation with occasional use of additional musicians which includes producer Laurie Lewis, who adds harmony vocals to a couple of tracks. Of the songs two are co writes between Melody and Jacob, six are by Melody and there are covers of songs by Peter Rowan, Paul Simon, T.W. Massie and one traditional arranged Groopman. Retinue is a beautifully sung and played slow moody duet led by a gorgeous acoustic guitar sound on a folksy tale that gets under way with Jacob’s atmospheric, warm vocal before Melody joins him on harmonies, and then the two vocalists interchange verses. Black Grace is a gorgeous uplifting harmony laden song that tugs the emotions all over the place with Melody’s heartfelt vocal dominating a powerful tale. Come On Mule is a banjo led ‘old timey’ country familial farming song with Jacob on lead vocal and acoustic guitar and Melody adding harmonies to the chorus on a tale that has a classic country feel, similarly O Heartbreaker, but this time with Melody on lead vocal. Again, this has a nice banjo, supplemented by dobro and acoustic guitar giving a strong classic country feel on a slow moody tale of someone wallowing in a lost love, with Jacob adding his harmonies. Sweet Sunny South includes an excellent mandolin lead on a traditional song that is steeped in tragedy, with Jacob on lead vocal on an intensely dramatic version of the tale that is even more sparse than the other songs on the album. Final mention goes to the Melody penned Yellow Haired Girl with Melody herself on lead vocal and the only backing being harmonies and a little body and hand percussion, as well as harmonies from Linda Tillery, yet another exercise in this duo’s versatility! Overall there is a tremendous freshness and vitality to the music that this couple makes together. Add the songwriting skills, Melody’s beautiful versatile vocals and Jacob’s also excellent vocals along with his amazingly dexterous mastery of stringed instruments and to describe them as a match made in heaven is not too much of an imagination stretch! This will hopefully be the first of many duo albums by a couple with the strengths to be soloists.